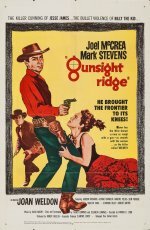 An undercover agent for a stagecoach company plagued by bandits takes over as a town's sheriff when the previous lawman is killed by the outlaws' leader. He sets out to bring the criminal to justice, unaware he is masquerading as a respectable mine owner. Western, starring Joel McCrea, Mark Stevens and Joan Weldon. This western starring Joel McCrea and containing a secret piano-playing villain called Velvet Clark can't be all bad. The middle-aged McCrea is an undercover agent who rides a well-worn trail to track down the aforementioned Velvet (Mark Stevens), currently operating under the guise of a mine owner. McCrea ends up as the town's new sheriff after the previous incumbent meets with an accident, and he gets the girl (Joan Weldon). McCrea's authoritative presence always provides some pleasure.